The immediate appeal of Tom Roberts’ Lady with a Parasol, c.1889 comes from its masterly handling, subject and colour. Painted en plein air, the fresh, lively atmosphere is enhanced by the combined look of self-assurance and informality of pose, the slight angle of the head adding a quizzical touch as sunlight plays sensuously across form and fabric. It also provides a strong fashion statement in both dress – loose necktie and the jacket’s wide lapels – and social commentary in the growing independence of women. Inviting of appearance and modishly dressed in white (better suited to the Australian climate), touches of pure black in tie and shoes afford further enlivening contrasts. This is extended in the cropped left edge of the composition, suggesting modernist influences of photography, and spontaneity of realisation characterising the best of French Impressionism. The influence of James McNeil Whistler is present in the captivating elegance and simplicity of presentation, echoes of aestheticism and Japanese art. Whistler’s own painterly journeys in white include the magnificent Symphony in White, No. 1: The White Girl, 1862 in the collection of the National Gallery of Art, Washington. In Lady with a Parasol Roberts introduced a subtle elongation, giving a gentle sophistication to the informality of his figure, the casual moment captured with an engaging vivacity of realisation. The most striking accent is, of course, the red – of parasol, hatband, and touches on the right hand and nearby bush. They not only provide bold contrasts against the blue-green of the background, but also offset the brilliance of the white accents on sleeve, shoulder, arm and cuff. While red and white is not entirely new to Roberts’ art, tracing the journey of their appearances in his work, however, helps throw new light on the dating of this painting. Variously given as c.1886 and early 1890s, Helen Topliss in her 1985 catalogue raisonné of Roberts’ work, proposed a date of c.1886. She wrote: ‘The frontal pose and the bush setting would seem to suggest a date in the mid-1880s. Most of the portraits painted in the mid-1880s are frontal or three-quarter views. The handling of the background landscape resembles work done in the 1880s’.1 Later, in 1996, the catalogue to the Roberts’ exhibition under Ron Radford’s aegis, stated: ‘The front facing pose and bush setting’ are given as reasons for dating the painting ‘in the early 1890s, as [is] the handling of the bright background landscape’.2 The new date of c.1889, when Charles Conder’s influence was considerable, is proposed for the reasons that follow.In 1886, when Roberts painted A Summer Morning Tiff, 1886 (Art Gallery of Ballarat), the centre of attention was the young woman dressed in white. The model was Harriet McCubbin, sister of Roberts’ friend, Frederick McCubbin and student at the National Gallery School, Melbourne. Roberts wrote that she stood ‘… in sunlight, among some exquisite young firm saplings…’.3 and Lady with a Parasol share a bush setting of young saplings, the realism of one and the breadth of handling and colour of the other mark the differences. In Reconciliation, c.1887 (Castlemaine Art Museum), the companion painting to A Summer Morning Tiff, the figure in white continues to dominate. And in Slumbering Sea, Mentone, 1887 (National Gallery of Victoria) the white dresses have an added touch of red accents in the cap of one and flowers in the hat of another. Roberts met Conder in Sydney in early 1888. In April they painted together en plein air at Coogee, Roberts’ Holiday Sketch at Coogee, 1888 is in the collection of the Art Gallery of New South Wales and Conder’s Coogee Bay, 1888 in the National Gallery of Victoria. The foreground of Conder’s painting shows a woman and child in white, the former holding a folded red parasol. Both Virginia Spate and Ann Galbally noted the change in Robert’s painting. Spate described Holiday Sketch at Coogee as ‘Roberts’ most brilliantly coloured painting’ and referred to his ‘new adventurousness in the use of paint and colour’, offering ‘excitement at the intensity of Sydney’s light and colour’ as a possible explanation. Another was the ‘Sydney painters who were already more strongly influenced by the Aesthetic movement than were their colleagues in Melbourne’. She concluded, ‘… the colours in Roberts’ painting are warmer and more expressive than in earlier works and this may partly have been due to Conder’s example’.4 Galbally observed that painting with Conder ‘… may have left Roberts at something of a turning point. Should he persist with his realist vision and palette and continue to seek that which he felt characterised Australia, or should he change style, embrace the new fluidity of painting on wood panel and make a serious study of colour and light effects in nature … ?’5Lady with a Parasol shows evidence of Conder’s influence in the more daring composition of lively angles and verticals, and exploration of the naturalistic and decorative use of colour. 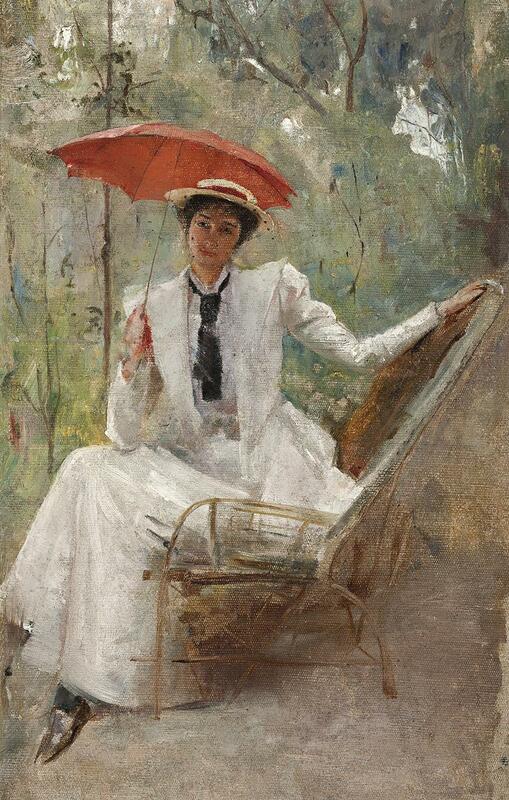 The decorative use of red, especially for parasols, featured in a number of Conder’s paintings in the year he met Roberts, All on a Summer’s Day, 1888 (Art Gallery of South Australia) and A Taste for Literature, 1888 (Art Gallery of Ballarat) being but two. This fascination continued to feature in his Melbourne works, especially A Holiday at Mentone, 1888 (Art Gallery of South Australia). 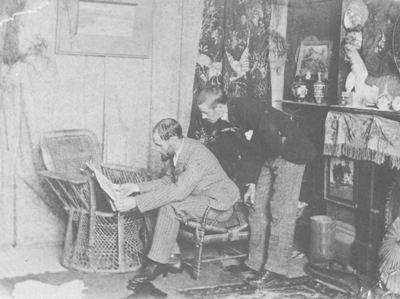 For a time Roberts and Conder shared a studio in Collins Street. The year 1889 is memorable in Australian art for The 9 By 5 Impression Exhibition of oil sketches and studies by Roberts, Arthur Streeton, Conder, Frederick McCubbin and others. Conder included a portrait of Roberts, An Impressionist, 1889 (Art Gallery of New South Wales). The catalogue’s notice ‘To The Public’, stated that ‘An effect is only momentary: so an impressionist tries to find his place. … in these works, it has been the object of the artists to render faithfully, and thus obtain first records of effects widely differing, and often of very fleeting character’.6 Roberts’ paintings included the lively handled portraits Cream and Black, 1889 (private collection), Harpers Weekly, c.1899 (National Gallery of Victoria), and La Favorita dominated by the brilliance of the red dress. All have the painterly freedom of a momentary effect. During these years Roberts also excelled in painting the formal portrait, an elegant example being Madame Pfund, c.1887 (National Gallery of Victoria). And his engagement with children reached a new height in Miss Lilly Stirling c.1888 (National Gallery of Victoria), its dazzling whites against a greenish background, informality and quizzical look recalling Lady with a Parasol. Another, Head Study of a Young Woman, 1889 (private collection), though much smaller in scale, likewise shows an affinity through the same direct, wide-eyed look, inclination of the head, prominent, black eye lashes, a momentary engagement captured in paint. Moreover, the red parasol continued to make its statement in later paintings by Roberts as in Christmas Flowers and Christmas Belles, c.1899 (Manly Art Gallery and Museum). 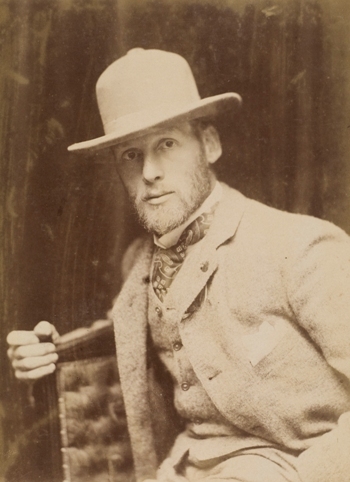 Painter of the fashionable and famous, pastoralists, politicians and professors, actors and artists, Tom Roberts was Australia’s leading portraitist of his time. He also created the grand, national narrative. From the brush of the same master, Lady with a Parasol provides a brilliant momentary effect. Sitting happily between portraiture and subject picture, it embraces the sketch and the more finished composition, as Roberts reveals his considerable gifts as a painter of the figure and the Australian bush.